Just before year-end, I bought this…. 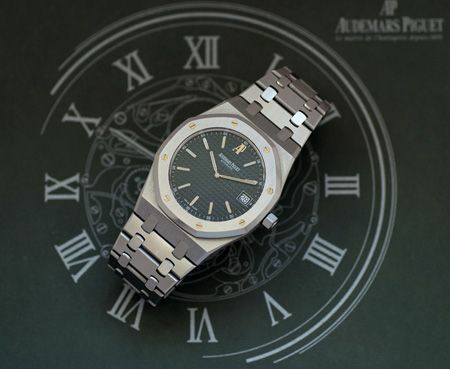 Just before year-end, on the 24th of December to be exact, I traded my Audemars Piguet Royal Oak ref.15300 for a 15202ST (or 15202ST.OO.0944ST.02 in full). Although I was very happy with my white dialed Royal Oak 15300, the 15202 ‘Jumbo’ remains to be the original Royal Oak in my opinion. 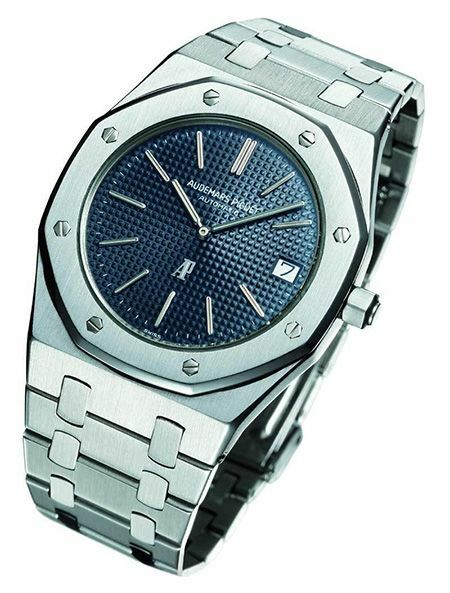 The original G?É¬©rald Genta creation of 1972 still lives in the current Royal Oak collection, bearing reference number 15202ST. 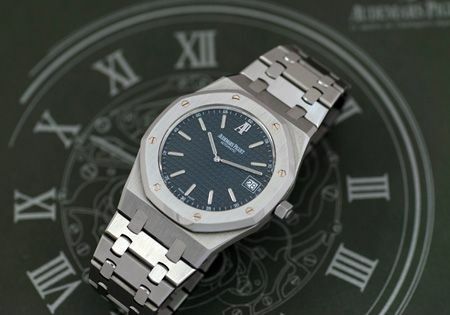 The original Royal Oak ‘Jumbo’ is pictured below, with reference number 5402. As you can see, the hour markers are a bit different than the current ‘Jumbo’ and the AP logo changed position. If you look even more closely, you will notice that the dial pattern is a bit different too. 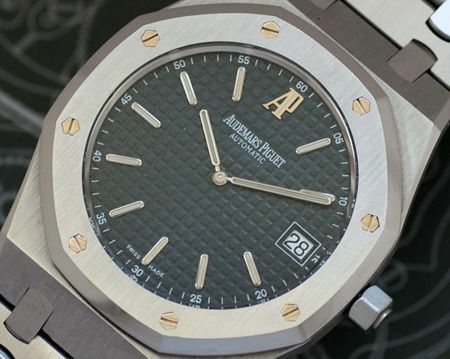 The squares are a bit smaller than on the current models of the Royal Oak series. What didn’t change, is the size of the watch, the lack of a second hand, the movement caliber (2121) and the thin case. 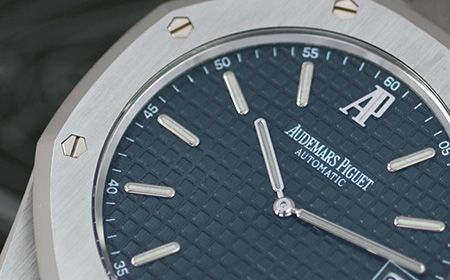 The thin case is only possible because AP still uses the caliber 2121 movement, which has a height of only 3.05mm thick, including the 21ct gold rotor. The screws in the octagonal bezel are still made out of white gold, as are the minute and hour hands. Below a picture of the movement, dis-assembled (without rotor) not even 3mm in height. Picture credits to Matthias S of the German R-L-X forum. 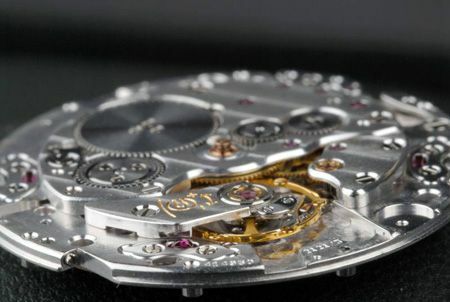 I think a lot has been written about this movement already, also used by Vacheron Constantin (caliber 1120 in their ‘222’) and the Patek Philippe Nautilus (caliber 28-255), all based on Jaeger-LeCoultre’s caliber 920. Story is that VC, PP and AP had some influence/input when JLC created this movement. Later on, only AP made this particular movement in license of JLC. The main difference between the 15300 and 15202 are the thickness of the watch and bracelet and, ofcourse, the second hand. From an owners perspective, I have to say that I really had to get used to the 15202 ‘Jumbo’ the first few days, as the bracelet is really thin in comparison to the one of the 15300. It feels a bit like wearing a vintage watch, where the 1972 design kicks in again probably. However, it wears very comfortable on my wrist and the look of the watch’s face (there is almost no space between the dial and the sapphire crystal) is simply amazing. Although I was a bit weary at first, that I would miss the new and updated bracelet, and the white face with long(er) hour markers, the Jumbo is here to stay and I consider it the master piece of my very modest collection of time pieces. The name ‘Jumbo’ is a bit out dated as well, since 39mm isn’t that Jumbo and the 15300 is even a bit larger in size. However, it could be considered authentic to keep calling this particular model ‘Jumbo’. Enough talk, here are some of the photographs that I took today! 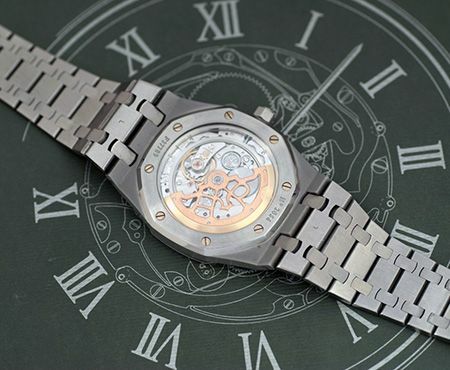 And here is a lousy shot of the transparent case back, showing the wonderful caliber 2121 movement. You can clearly see the superb finished rotor, with the 21ct gold mass attached to it. 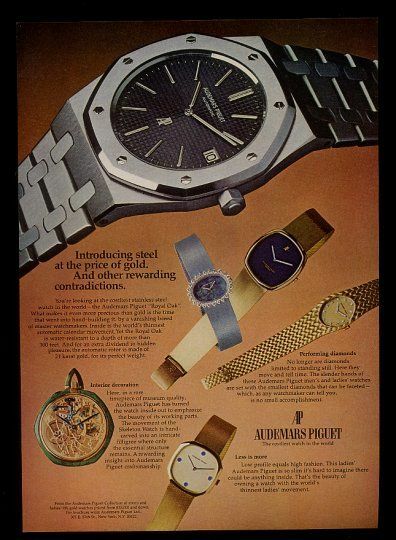 Lastly, I recently found this vintage (probably 1970s) advertizement of the Royal Oak that I love to share with you.